The BBC has rebuilt a 20ft telescope designed by pioneering astronomer William Herschel, who discovered Uranus in 1781, the first planet to be discovered with a telescope. The ambitious project is a collaboration between BBC Learning and the Stargazing Live television team, who will reveal the telescope on the programme this evening, in a live link-up from Derby. Series producer Krisztina Katona, who was in charge of getting the telescope made, likens it to building an extension on your house. She has even more appreciation for Herschel's achievements as a result of her recent experiences, saying what he accomplished with crude materials was 'absolutely extraordinary'. 'The telescope was the Hubble of its time,' she tells Ariel. The build started in December, with planning commencing in November, making it a quick turnaround. Herschel, who was born in 1738 and was also a well-known composer, catalogued 2,500 nebulae and also discovered two of Uranus' major moons (Titania and Oberon) and two moons of Saturn. He did this by building his own reflecting telescopes using a speculum metal mirror. These mirrors usually contain two parts copper to one part tin, along with a small amount of arsenic. It proved impossible to recreate this mirror as Herschel made it, Katona explains, because it would have taken the team a year. The mirror was also impractical - it had to be polished 16 hours a day to make it workable. 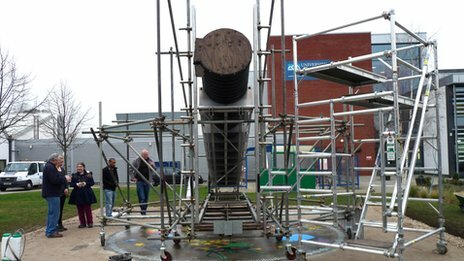 The BBC telescope - made from Herschel's drawings and to his specifications - instead uses modern optics and metal scaffolding (instead of a dangerous wooden structure used by Herschel). It may not be an exact replica but is a very close modern approximation. The tube through which you can view the sky is actually a sewage pipe and the concrete slab on which it sits has a mural designed by local schoolchildren. It will stay on the campus long after the television crews have departed. And does it actually work and will you be able to see Uranus? Katona remains tight-lipped, saying only that people will have to tune in to the programme to find out.